SAN JOSE, Calif. -- Oct. 26, 2015 -- Quantum Corp. (NYSE: QTM) today introduced Xcellis(TM), a next-generation, high-performance, end-to-end, shared workflow storage solution that empowers users to boost their efficiency, productivity and creativity in delivering the products and services that drive their business. Consolidating media and metadata management, extending connectivity options for both Fibre Channel and Ethernet clients, and supporting hosted applications, the new system greatly enhances productivity in collaborative media environments by integrating the most important components of workflow storage into a single, easy-to-manage, fully scalable hardware solution. This solution supports online work in process, ingest and delivery, and archive through Quantum&apos;s portfolio of Lattus(R) object storage, LTO tape and Q-Cloud(R) services, all running on the powerful StorNext 5 media workflow platform. Today&apos;s modern, high-resolution media workflows demand the highest levels of performance and collaboration out of the underlying storage infrastructure. At the same time, media content has long-term value and needs to be cost-effectively retained in an easy-to-access archive. Xcellis helps solve these challenges by combining the power of SAN and the low-cost connectivity of NAS in a single, continuously scalable system, thereby simplifying the storage architecture and streamlining operations. With Xcellis, workflows are enhanced to drive greater efficiency, productivity and creativity while also enabling long-term content archives using either private or public cloud infrastructure. Xcellis takes workflow storage to the next level by integrating real-time and "non-real-time" media production support elements in the same system. At the heart of the new solution, the Xcellis Workflow Director controls shared client access privileges and provides simultaneous client connectivity across all popular network types, including Fibre Channel and IP for SMB, CIFS, NFS and Quantum&apos;s higher-performing Distributed LAN Client (DLC) -- while also supporting hosted applications. By bringing the functionality of multiple disparate components into a single system that occupies just 4 RU of space, the Xcellis Workflow Director both simplifies the overall storage architecture and streamlines operation and management. Optimized for modern workflows, Xcellis also recognizes that many operations do not require high-speed Fibre Channel and can instead take advantage of low-cost IP NAS connectivity. Xcellis improves productivity by eliminating the need for separate islands of storage and allowing all clients and workflow automation operations such as transcode, QA and delivery to share storage with complete transparent access to all assets and content, regardless of interface type or operating system. * Industry-best streaming performance for ingest, transcoding and delivery, especially important for today&apos;s high-resolution and HDR-enabled workflows. * Optimized high-speed Fibre Channel SAN connectivity for which StorNext(R) is known, along with cost-effective LAN, SMB and NFS sharing options, with IP connectivity for easy deployment and integration into all broadcast and postproduction environments. * Intelligent, policy-driven file movement across LTO tape (LTO-6 and LTO-7), LTFS, object storage and cloud archive systems for an optimal balance of media access and storage TCO. * High-speed collaboration across Mac OS X(R), Windows(R) and Linux. * Scale capacity and bandwidth independently to realize the performance characteristics ideal for their operations, tuning performance to the roles of different individuals within the workflow. * Protect and maximize their investment by paying only for what they require and eliminating disruptive and costly hardware changes as their system grows. * Independently and economically scale performance and capacity, now up to 10 billion unmanaged files, or 1.4 billion managed files in up to 64 file system volumes. 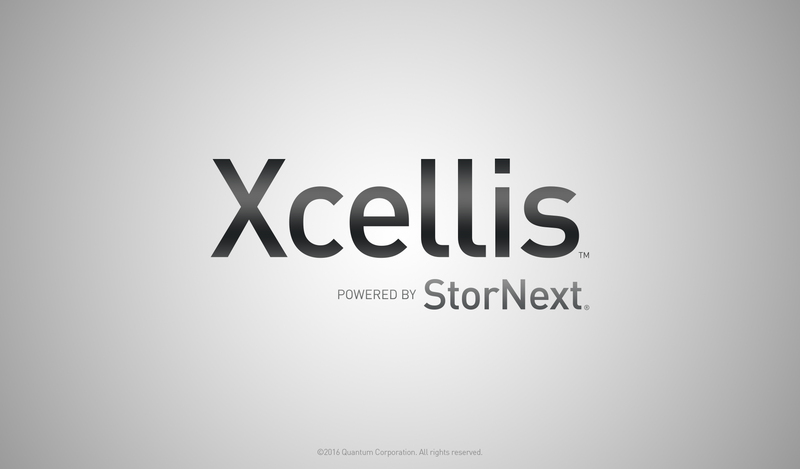 Xcellis also features StorNext Connect(TM), the full-featured management tool that supports users in configuring, deploying and scaling the entire storage system and clients and also helps them to identify and resolve issues quickly for optimal performance and maximum uptime. Quantum is continually updating StorNext Connect, and Xcellis users will benefit from a newly enhanced customer self-install feature, as well as NAS (IP client) configuration within the StorNext Connect UI. StorNext Pro(TM) Solutions -- complete turnkey workflow storage solutions custom-tailored to meet specific media industry challenges such as 4K production and Xsan refresh -- have also been updated with Xcellis configurations. By leveraging the Xcellis Workflow Director, StorNext Pro Solutions now offer greater scalability and improved performance and connectivity options, providing even greater value for facilities requiring a turnkey solution. "Quantum is the leading innovator of technology for powering creative workflows in demanding environments. Xcellis is the next step in overcoming traditional storage constraints  consolidating storage, management and shared access in a single, flexible and scalable system. At Factorial we are very excited about the increased efficiency, collaboration and performance that Xcellis will offer our customers." "Xcellis shared workflow storage consolidates client access control, client connectivity and hosted application capabilities into a single solution with extraordinary in-place scalability. These advanced capabilities help users improve efficiency and productivity and meet ever-greater demands in high-resolution workflows. In addition, Xcellis offers flexible configuration and scalability options to reduce the cost and complexity of deployment while facilitating smart, simple and cost-effective growth." Quantum is a leading expert in workflow storage, archive and data protection. The company&apos;s StorNext 5 platform powers modern high-performance workflows, enabling seamless real-time collaboration and keeping content readily accessible for future use and re-monetization. More than 100,000 customers have trusted Quantum to address their most demanding content workflow needs, including top studios, major broadcasters and cutting-edge content creators. With Quantum, customers can Be Certain(TM) they have the end-to-end storage platform they need to manage assets from ingest through finishing, and into delivery and long-term preservation. See how at www.stornext.com. Quantum, the Quantum logo, Be Certain, Lattus, Q-Cloud, StorNext, StorNext Connect, StorNext Pro and Xcellis are either registered trademarks or trademarks of Quantum Corporation and its affiliates in the United States and/or other countries. All other trademarks are the property of their respective owners. "Safe Harbor" Statement: This press release contains "forward-looking" statements. All statements other than statements of historical fact are statements that could be deemed forward-looking statements. Specifically, but without limitation, statements relating to 1) benefits and value to customers from using Quantum&apos;s Xcellis workflow storage systems, StorNext Connect and StorNext Pro Solutions and 2) customer demand for and Quantum&apos;s future revenue from such systems, tools and solutions, are forward-looking statements within the meaning of the Safe Harbor. All forward-looking statements in this press release are based on information available to Quantum on the date hereof. These statements involve known and unknown risks, uncertainties and other factors that may cause Quantum&apos;s actual results to differ materially from those implied by the forward-looking statements. More detailed information about these risk factors are set forth in Quantum&apos;s periodic filings with the Securities and Exchange Commission, including, but not limited to, those risks and uncertainties listed in the section entitled "Risk Factors," in Quantum&apos;s Quarterly Report on Form 10-Q filed with the Securities and Exchange Commission on August 13, 2015 and in Quantum&apos;s Annual Report on Form 10-K filed with the Securities and Exchange Commission on June 12, 2015, especially those risks listed in this section under the headings "Our operating results depend on a limited number of products and on new product introductions, which may not be successful, in which case our business, financial condition and operating results may be materially and adversely affected." Quantum expressly disclaims any obligation to update or alter its forward-looking statements, whether as a result of new information, future events or otherwise, except as required by applicable law.